Blackberry adores other cats! The perfect playmate, she's happy just hanging out or playing with her kitty companions. But she prefers to watch people from a safe distance. Born in 2005, she's in good health. Blackberry came to the Sanctuary from an overcrowded situation in Pahrump, Nevada. Her neglect made it so she is shy around people, but she loves to snuggle with other cats. 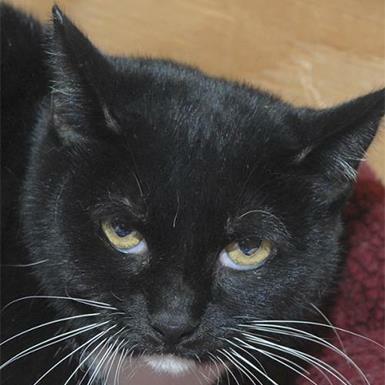 Blackberry dreams about a home with kitty friends and humans who will give her some space. Would your cats let her come over to play and stay forever?